In the summer of 1920 I was summoned to the Tcheka - the name GPU was not yet in use at the time - of Rostov-on-the-Don. The summons was carried out by the Judaism-hating "Jewish section" of the communist party, the infamous Yevsektzia. The summons was typical to the manner of the Tcheka. I had not yet concluded the morning prayers (I was leading the prayers myself, for it was within the year of mourning after my holy father's passing) when the three emissaries from the court of death entered the room - dressed in their uniforms of red and black, rifles in hand, their belts filled with bullets and hung with a pair of revolvers and another pair of Cossack knives, with helmets of brass and their faces aflame. They approached me and said: "You are summoned to immediately accompany us to the offices of the Tcheka." Two of the messengers were from the Yevsektzia and the third a non-Jew. The two Jews wished to strip me of my tallit and tefillin on the spot. When I told them that I must first finish my prayers - we were at the Monday supplement Vehu Rachum - and the study of mishnayot which follows, they let loose a barrage of curses and yelled at me to remove my tallit and tefillin immediately. (Incidentally, one of them was a refugee from the city of Shavel who had come to me for assistance. I had arranged a position for him at a cigarette business and later I had loaned him money to establish a business of his own. For the next three years - up until the revolution - he earned a respectable living.) Were it not for the intervention of their non-Jewish colleague, they would have forcefully interrupted my prayers. When I finished reciting the final kaddish which follows the study of mishnayot, I removed my tallit and tefillin and went along with my armed guardians. One walked on my right, a second on my left, and a third behind me - in the manner that those accused of treason against the regime are led. When we arrived at the courtyard of death, they led me to a large chamber in which some fifteen persons sat along both sides of a long table. At the head of the table sat another two, and I was seated opposite them at the foot of the table. My three guards sat behind me, left, right, and center. One of those seated at the head of the table addressed me: "We are the members of the Party's Committee to Investigate Religions, now occupied in investigating the Jewish religion. We have various questions. We have already summoned Rabbi Berman and Rabbi Goldenberg - we asked what we asked and they answered what they answered. 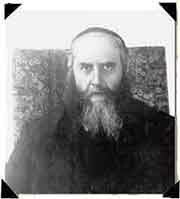 Now we have summoned Rabbi Schneerson to resolve certain issues pertaining to Kabbalah and Chassidism." All this was said in the Russian language. I answered in Yiddish: "I have already made it clear on the two former occasions on which I was summoned to the Tcheka that I will not budge from my principles. There is yet to be born and never will there be born, the man or demon who will move me in the slightest degree from my principles..."
Before I finished my words I was interrupted by a "committee member" seated on the right side of the table. He lifted the revolver which lay on the table - in addition to the arms which they all wore on their belts, a revolver lay on the table before each of the assembled - and pointed it at me, saying: "This toy does away with 'principles.' Fear of it has opened many a mouth. Also the dumb have become talkative before it." "You are utterly mistaken," I replied. "This toy impresses only the cowardly atheist, who has but a single world and many gods (ein velt un asach getter) - every hedonist has his many gods. But as for us, who have but a single G‑d and believe in two worlds, the toy which you are brandishing not only fails to frighten, it makes no impression whatsoever." From the diary of the sixth Lubavitcher rebbe, Rabbi Yosef Yitzchak Schneersohn; translation/adaptation by Yanki Tauber. The ending is clearly implied. The Rabbi was not martyred - this is from his own writings. monotheism in Rostov Interesting. But how does the story end? Not everyone was as brave and they were just as Jewish. One of our most important principles is life, l'chaim, with very few exceptions. We do not honor martydom like the other religions. Monotheism... I admire this man's firmness in his faith and believes! What a remarkable testimony of strength!!! Rabbi Yosef Yitzchak - Monotheism Ms. LeeJai Cook, Roaring Springs Texas USA. Bully for him. More religionists should have the courage of their convictions. Faith vs knowing After I read this, I thought about my belief. And I too believe in a single G-d and two worlds. Yet, if this is really true, then I how could I possibly be afraid of another person or situation?